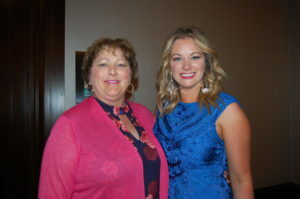 Claire Cunningham was honored as Juliette Fowler’s Visionary Woman of the Year at Friday’s annual luncheon at Dallas’ Omni Hotel. The long list of community achievements attributed to Claire include teacher and advocate for children. She is credited with the creation of Dallas ISD’s successful magnet school program and was instrumental in the peaceful desegregation of Dallas ISD which became a model for the nation. A graduate of SMU and a Chi Omega, Claire has served in many civic organization including TACA, National Parent Teacher Association and the Women’s Council of the Dallas Arboretum and Botanical Garden. Other honorees were the Juliette Fowler Faith and Service Award to Sarah Jones and the Erika McKenzie Volunteer Award to Lakewood resident Natalie Morin. One of the highlights of the luncheon was a video, “Frame the Future” featuring Juliette Fowler CEO Sabrina Porter. Once again, the Dallas Omni provided unsurpassed service and an excellent menu of short-rib pot roast, jalapeno cheese grits and roasted vegetables. The whimsical table décor with “utopiary” centerpieces by the Sample House brought Dallas’ beautiful Arboretum indoors. Flower-filled canine topiaries (because at Fowler your dog is welcome) were available for purchase and many guests left with a new addition to their own garden. Central Christian Church (Disciples of Christ) supports Juliette Fowler Communities’ mission to provide independent and assisted living to seniors, health and rehabilitation services, memory support, a foster-to-adopt program, and The Ebby House, for young women who have aged out of foster care, through Central’s tithe and volunteer work. Central members Mary and Roland Bandy sponsored the luncheon at the Vivian Sponsor Level, and several members of the church attended the luncheon in a show of support of the life of fulfillment that Juliette Fowler Communities provide to members of our society who often need it most.